Like Budapest, Zagreb is two cities divided by a river. Novi Zagreb lies to the south of Zagreb, across the river Sava, and was developed to house the growing population. Its skyline is dominated by the socialist realist monoliths, that I, on a grey January morning, set out to explore on foot. As an important hub within Tito’s Socialist Yugoslavia up until the ‘90s, when the country broke apart in the bloodiest wars of Europe’s recent history, Zagreb at one point vied with Belgrade for leadership of the country. 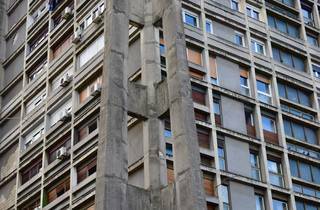 During this period Croatia got more than its fair share of socialist realist architecture, made from identical concrete panels that were rolled out on vast production lines. The city now boasts some of the largest examples of this architecture in Central Europe, much of which can be found south of the river. Visitors staying in the pastel coloured Old Town may be put off by nicknames such as ‘Commie blocks’, but should remember that at the core of the housing blocks is a utopian vision of how the cities of the future might look. Forget the oxidised copper roofs of the Austro-Hungarian centre, the boxy housing estates are where you’ll find the interesting stuff. I don’t walk far from the centre before I hit Béton brut (raw concrete, from which we get the word ‘Brutalism’). Down Savska cesta just before the river are the Rakete, three rocket shaped towers that were modified after the 1963 Skopje earthquake to withstand further tremors. The nickname comes from the angled appendages on the sides of the buildings, which points them up towards the sky like rockets. The details of the rockets hold my gaze: the subterranean parking, dripping wet and covered in lush green foliage; the interconnected walkways, built to exclude anyone over six foot; and the bunkered down staircases keeping guard over the south end. I end up frantically taking photos of the close-up details, each time finding new patterns, and getting even more lost. Outside there is plenty of green and open space, and so it is possible to step back and get some interesting angles on the towers. The concrete basketball hoops in the play park, at least that’s what I think they’re meant to be, loom at each other, over a cracked grassy court that looks as though it doesn’t get much use. The hoops offer an elaborate solution to what in other countries is just a pole with a circle on top. Crossing Most slobode into Novi Zagreb I find Mamutica, or the mammoth, with little difficulty - it stands out, the biggest amongst the surrounding blocks at 70 metres high and 240 metres long. 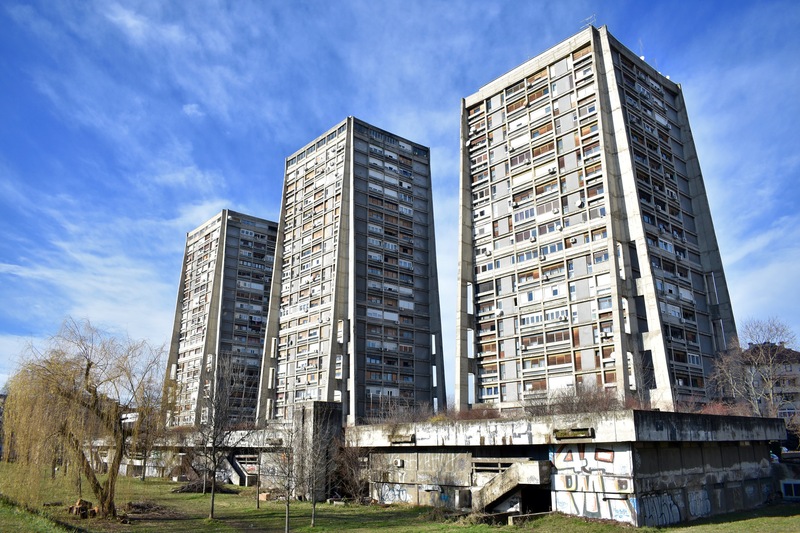 It has 20 floors, houses 5000 people and was, at the time of its construction in 1974, the largest housing block in southeast Europe. 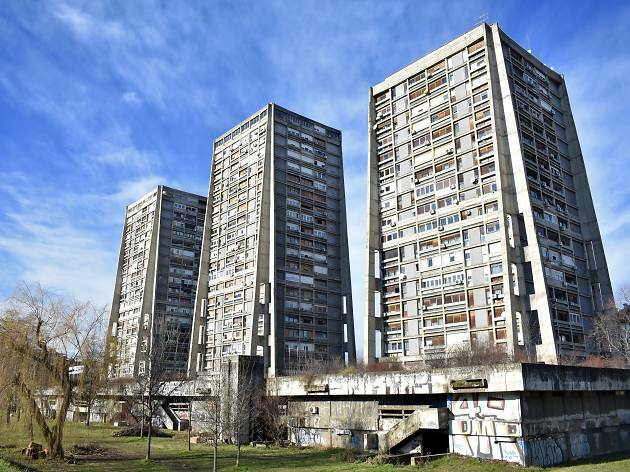 It’s a decent walk into Novi Zagreb and you end up walking around these monoliths a few times over, so at this point you’ll probably need a break. Fortunately, there is a supermarket on the ground floor of the first tower and plenty of concrete seating. Super Andrija, a magisterial building inspired by Le Corbusier’s Unité d’habitation, is only several streets away from here, so if you’ve got this far from the tourist track already, I recommend that you go on a little further. Built in 1973, the flat and grey sides that bookend the structure remain blank. To this day they have not been decorated with murals, just a little graffiti at their bottoms, but nothing to break up these two vast walls of grey. The central pillars are industrial, like something from a huge power station. It’s not all utilitarian design though, there are decorative flourishes, such as the glass windows around the central pillars which in the right conditions let the light shine through. Apart from a few old people milling about, there doesn’t seem to be much going on here. The corridors are empty, the small half pipe out front is rusted, and the Kodak photo shop is well and truly shut. Although shattered after my walking tour of Zagreb’s socialist realist big hitters, I am rewarded with this calm moment of reflection. As I look up at the tower block the pastel colours of the city centre’s Old Town not only seem a world away, they also pale in comparison to the intricate beauty of these monoliths. 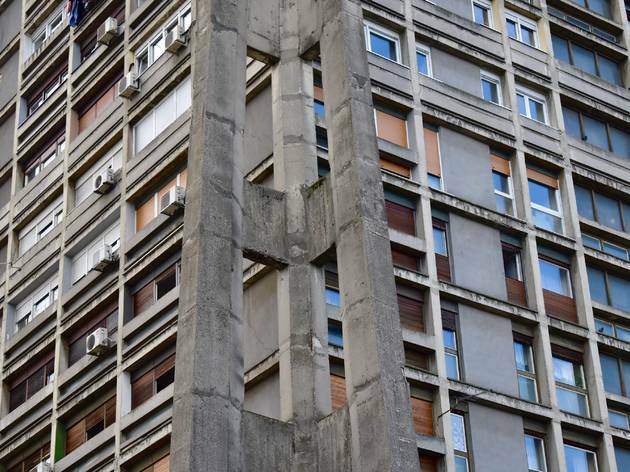 A walking tour of Zagreb's socialist architecture from Daryl Mersom on Vimeo. RECOMMENDED: Brilliant neighbourhoods to visit in outer Zagreb.